A lifelong study by one pioneering scientist has opened our eyes to the secrets of primate society. Now, the story of his discoveries and of this unique group of monkeys can be told in full. ‘A Life among Monkeys’ tells the story of Smithsonian primatologist, Dr Wolfgang Dittus, through the unfolding narrative of the lives of the toque macaques monkeys, living among the spectacular ruins of an ancient temple in the heart of the Sri Lankan jungle. We encounter a complex hierarchy, inhabited by cute but naïve newborns, politically savvy matriarchs and warring males, captured in rich archive film and contemporary 4K footage. ‘A Life among Monkeys’ combines immersive natural history storytelling with a fascinating journey of scientific discovery. 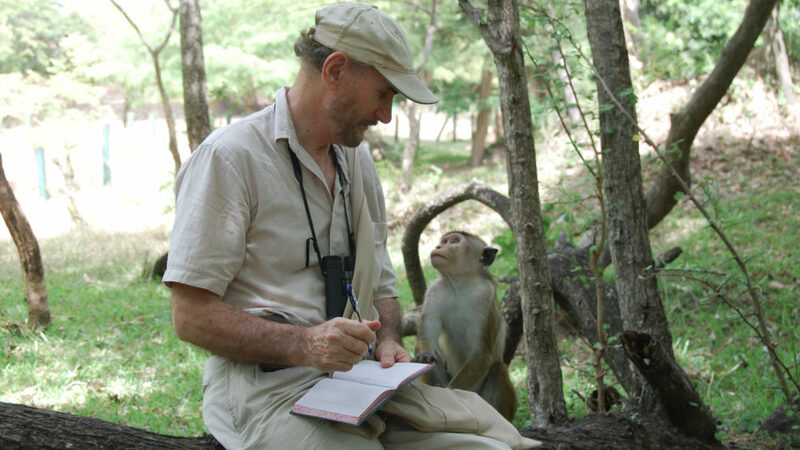 Wolfang Dittus’ pioneering study of the charismatic toque macaques of Pollannaruwa in Sri Lanka is the longest ongoing study of any primate group in the world. His work bears comparison with his more famous contemporaries, Jane Goodall and Dian Fossey. Like them he has unlocked secrets of primate society through long years immersed in their world. But remarkably, outside the scientific world, his story remains hardly known. Now, with complete access to his study and the remarkable monkey population of Pollannaruwa, this film will put the record straight. And next to the fascinating study material, there is an opportunity to revel in the natural beauty of Sri Lanka – and to witness the day-to-day life of the monkey group, including child-rearing, fighting, feeding, squabbling and all that fills a monkey’s day. Just as when Dittus first arrived in 1968, today’s real life dramas of a complex primate society play out against the backdrop of ancient temple ruins. In the day-to-day life of this remarkable troop of monkeys today, we see living evidence of Dittus’ key discoveries. Each chapter in the story of this remarkable study is explained with compelling new natural history sequences, and supplemented by a rich film archive spanning 40 years. Guided by Dittus himself, we meet the key characters of the troop in which he has identified and named hundreds of individual monkeys. We witness the behaviours that inspired his breakthroughs. And we bring up-to-date the remarkable 48-year story of a study that, despite civil war and human encroachment, has produced some of the most significant discoveries in primatology of the last century. In short, this project will highlight the ground-breaking work of a lifelong Smithsonian scientist, and tell a story that will engage audiences for many years to come. A co-production of Terra Mater Factual Studios and Smithsonian Networks produced by Keo West Ltd.